Are you considering trees or shrubs as a living fence on your property? Choosing a living fence over a conventional fence can be an excellent option. These planted perimeters look beautiful and can convey a feeling of peace. Living fences can be less expensive, too—installing a wood privacy fence is likely to cost $20 to $30 per linear foot. Living fences can cost as little as $1 per linear foot. That’s a savings of $1,450 on a 50-foot fence. And while many communities have rules restricting the construction of tall fences, restrictions governing the planting of trees and shrubs are rare. On the downside, living fences may need pruning, watering, mulching and fertilizing. They also are less effective than traditional fences at keeping pets within the yard and other animals out. Indeed, deer might nibble windows into a living fence, though this can be overcome through smart plant selection. The following plants can make wonderful living fences. But be sure to confirm with a local garden center that a specific plant is appropriate for your yard. Privet can be an effective and extremely affordable living fence. Confirm that the variety you select will grow to the desired height—some varieties of privet grow to only four feet, while others reach eight, 10 or beyond if not kept pruned. Prune once a year after the tiny flowers bloom in spring for a more informal hedge and again before late summer if you want a tighter, more formal look. On the downside, some people find the scent of privet flowers unpleasant when they bloom, typically in late spring. And most varieties of privet are “deciduous”—that is, they lose their leaves in the winter—so a privet hedge might not provide full privacy year-round. Young one-to-two-foot-high privet plants often can be purchased for just $4 apiece and grow very quickly, typically adding two to three feet of height per year. 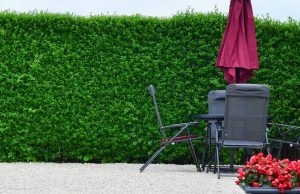 Privet plants can be positioned as much as four feet apart to form a hedge (though two- or three-foot spacing will create a tighter hedge) for a total price as low as $1 per linear foot. 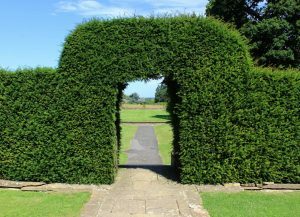 Yew grows into a tall, attractive and easy-to-prune hedge. Unlike privet, it’s an evergreen, so its privacy and beauty last year-round. Yew excels in the shade as well as in sun, making it a particularly good choice for sections of a lawn’s perimeter that often are in the shadow of buildings or trees. Yew is slow-growing, so if you purchase small plants, it could be many years before they give you full privacy. But slow-growing plants require ­infrequent pruning, done best in late winter or early spring. Young, small yew plants might sell for as little as $10 apiece, but you can easily spend $50 or more for more mature, larger plants. Space yews one to two feet apart to form an effective privacy hedge. Note: Yew is a particular favorite of deer. 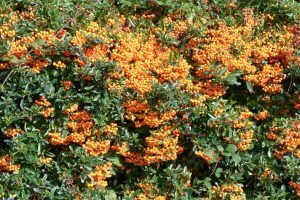 Pyracantha and holly are evergreen shrubs that provide more color than the typical privacy hedge. They produce beautiful berries in the fall and winter, plus white flowers in the spring and early summer. Holly’s berries typically are red, while pyracantha, also known as firethorn, feature a blaze of red, orange or yellow berries. Both of these shrubs are adaptable to a wide range of climates and growing conditions. But wear thick gloves while pruning them—some hollies have pointed leaves, and pyracantha has sharp thorns. Prices vary depending on plant size and variety, but expect to pay perhaps $20 to $30 for a young plant in a 2.25-gallon container. Position one plant every 18 to 30 inches to form a hedge. 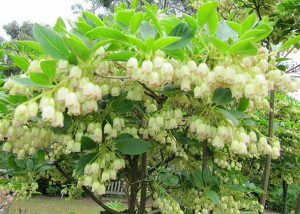 Enkianthus features clumps of little hanging flowers that typically are white, and it needs little to no trimming to stay in shape. It is well-suited for acid soils and shade, perfect for the understory of tall trees. Its fall foliage provides vivid orange and red colors. On the downside, it is slightly less dense than privet…and somewhat slower growing—it could take an extra year or two for enkianthus to provide full privacy. It also can be expensive—potentially $30 or more per plant. Enkianthus is deciduous, so do not expect full privacy in winter. Plant four to five feet apart. Bamboo (shown above) is a hearty, fast-growing type of grass that can form an elegant, effective living fence. Some varieties can grow to 50 feet or more. It grows well in a wide variety of climates and is far more deer-resistant than the other plants on this list. Most varieties are not technically evergreen, but bamboo provides an effective privacy fence year-round because it never becomes sparse. 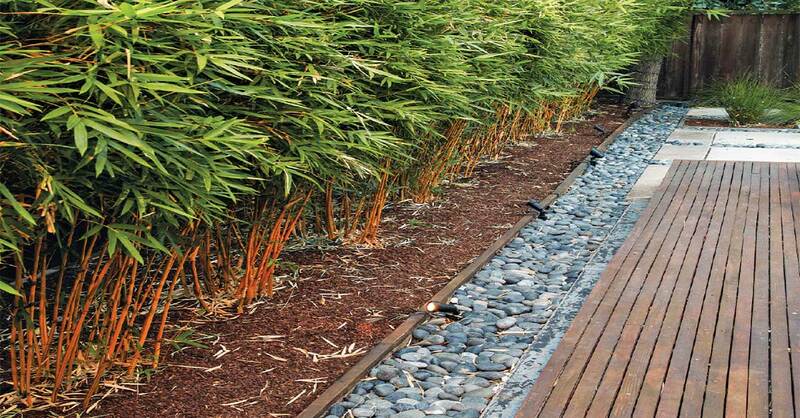 You’re likely to encounter two basic types of bamboo in garden centers—clumping and running forms. The running form may look more ­attractive but is very difficult to ­contain. It’s a good choice only in locations where it will not be able to spread, such as between two paved driveways or in a raised planter. Another way to contain it is to mow around its edges to keep the new shoots from developing. The clumping form grows in small hillocks and doesn’t mass together to form a grove as running bamboo does, but it won’t take over the surrounding land. Many varieties of bamboo appropriate for living fences sell for perhaps $30 to $60 for a three-gallon-container size. Expect to need one plant for every five to 10 linear feet. Willows are fast-growing and attractive deciduous trees appropriate for a wide range of climates. People don’t normally think of willows as perimeter plants, but many varieties produce thick, drooping foliage that can form an effective living fence. 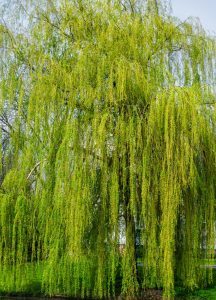 Willow’s foliage can have a silver, gold or lime green tint depending on the variety, but different varieties grow to different heights, so choose carefully. Willows tend to prefer moist soil, so they’re good for sections of lawn that do not drain well. Young willow trees might sell for $30 to $60 apiece. That might sound pricey, but you can plant willows five feet apart in a living fence, so you won’t need as many of them to form a fence as you would many plants on this list. 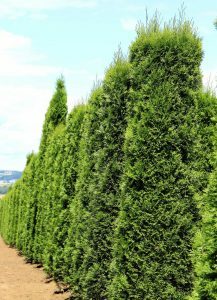 Arborvitae, juniper and cedar are elegant, attractive evergreen trees that can form effective privacy borders. Each is available in a range of varieties that generally do not require pruning. They are not as fast-growing as many other options on this list, however, and they can be fairly pricey—upward of $100 per plant if you purchase trees that already have reached four-to-six-feet in height. But if you’re willing to wait a few years for privacy, small, young trees can cost $15 apiece. Plant three to 10 feet apart, depending on width at maturity. Incorporate more than one type of plant into your privacy hedge. Using a variety of different plants will make your living fence appear more natural. 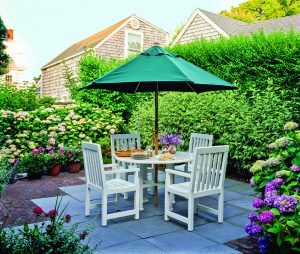 It also means that you can choose plants well-suited to the varied conditions of your yard’s perimeter—yew in shady spots, for example, or willows where soil drains poorly. Build up to the living fence with plants of increasing height. Plant the tall shrubs and trees listed here along the edge of the property, but also ­position shorter plants just to the inside of those tall plants. The resulting layered look will reduce the sense that the yard is surrounded by a wall. Prune nonvertically. Hedges such as privet and yew traditionally are pruned into vertical walls, but that’s not the only option. You can prune border plants into more natural-­seeming “mountain like” shapes that are thicker near their bases, for ­example.